DENVER — Jamal Murray missed his first eight shots before a scorching fourth quarter in which he scored 21 of his 24 points, leading the Denver Nuggets past the San Antonio Spurs 114-105 on Tuesday night and knotting their playoff series at a game apiece. The Nuggets were in danger of losing a second straight game at the Pepsi Center after posting the NBA’s best home record (34-7) during the regular season. They trailed 78-59 late in the third quarter before closing the game on a 55-27 run. “We gave up 38 points (actually, 39) in the fourth quarter. End of story,” fumed Spurs coach Gregg Popovich, who drew a technical foul during the Nuggets’ comeback. Nuggets coach Michael Malone said he never considered benching Murray because he didn’t want to crush his confidence. He said he took him aside at halftime and told him to take a deep breath and trust his shots would start falling. “Never once did I think about pulling him from the lineup,” Malone said. Good thing, too, because Murray, the goat in Game 1 after missing an open jumper and turning the ball over in the closing seconds, might have salvaged the Nuggets’ season while going 8 for 9 in the fourth quarter. The series shifts to San Antonio, where the Nuggets haven’t won since 2012, for Game 3 on Thursday night. Paul Millsap added 20 points for Denver and Nikola Jokic just missed his second triple-double of the series, scoring 21 points, pulling down 13 rebounds and dishing out eight assists. The Spurs got 31 points from DeMar DeRozan, 24 from LaMarcus Aldridge and 17 from Derrick White. 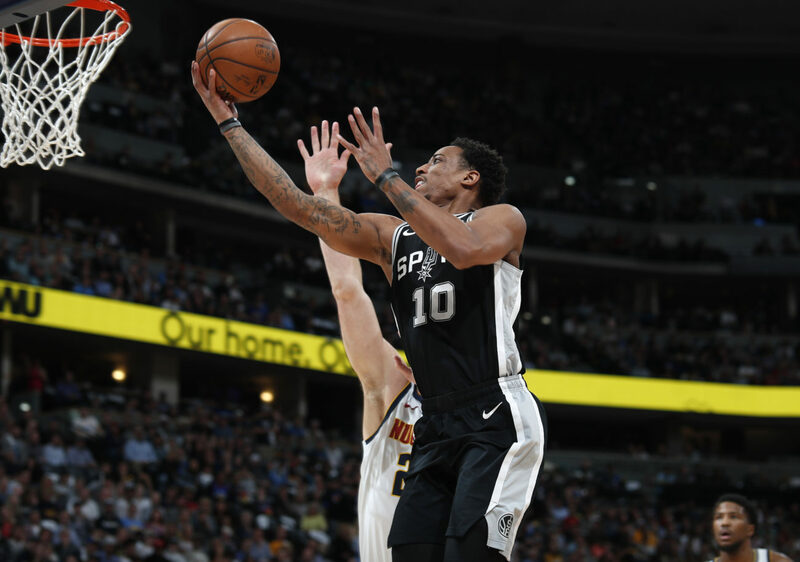 San Antonio led 78-59 with 4½ minutes left in the third quarter before the Nuggets started their comeback, cutting it to seven points entering the fourth quarter. They tied it at 95 on Murray’s jumper midway through the period, then took their first lead since the first quarter when Murray sank two free throws with 4:50 remaining for a 99-97 lead. San Antonio: The Spurs fell to 21-7 against Denver in the playoffs. They had won seven of their last 12 games in Denver, including the regular season. Denver: The Nuggets finally found their offensive rhythm but not before falling behind by 19 in the first half and hitting the locker room trailing 59-49 at halftime. … The Nuggets ended a seven-game home losing streak to San Antonio in the playoffs. The series shifts to San Antonio for Game 3 Thursday night.